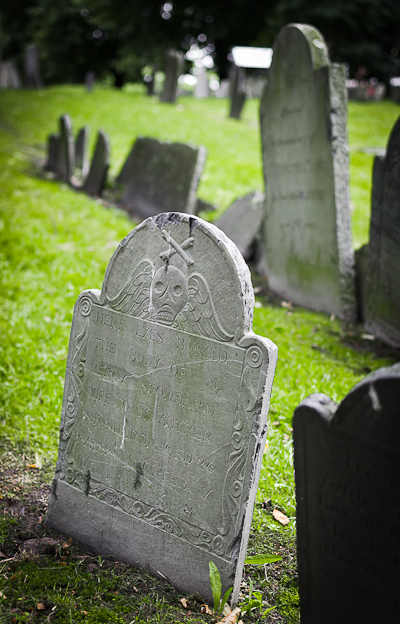 Loss, as represented by these New England tombstones, can seem cold and distant, but an up-close perspective reveals something far more personal. We travel for pleasure. We travel for work. And sometimes, we travel for others on journeys we would prefer not to take but that we know we must. My nephew died last week in a car accident. He was 26. He lived in Connecticut. My brother, his father, lives in Florida. My parents and I live in the state of Washington. And so, within days of the loss of a son, a grandson and a nephew, the four of us sat together in a funeral home in a small town in Connecticut mourning a life cut short. The dynamics of death are as unpredictable as the event itself. What you say, how what others say affects you, how grief works itself out in a group of caring people who all had different relationships and experiences with the departed, all of this seems both familiar and yet foreign at the same time. It feels a bit like traveling to a place that looks exactly like home, but where everyone speaks another language. Where a nod means one thing to one person, something else to another and yet you all understand…but in different ways. Amidst the comfort and disorientation of shared loss I found something utterly profound, something I could not fathom unless I had been there. As I both beheld and participated in the scene, I witnessed faces contorted by pain, scrunched up and clenched in expressions of such raw, undiminished grief that they lost the semblance to the person who bore them. Those faces became hideous. Many things have I known from the words of others. No parent should ever outlive his or her child. The purpose of a funeral is not for the one who died, but for those who survive, who must go on in the absence of the loved one. We are created for community, in life and in death. I have known these as concepts, descriptions from someone else’s journey. But by traveling to a place I would not choose to go for a reason I would never want, I have known them now in the same way that I am known; they are my own. And on this unwanted trip, I have seen a beauty that can only be found in the midst of deep loss and suffering, amidst something horrific and ugly.